Winters tend to be brutal and long here in New England! We often have multiple snowstorms right on top of each other, and bitter cold temperatures more days than not. It’s our least favorite season, but we always make the most of it, and keep our eyes on spring! Meanwhile, there is nothing like a delicious hot soup, to warm your soul and put a smile in your belly! 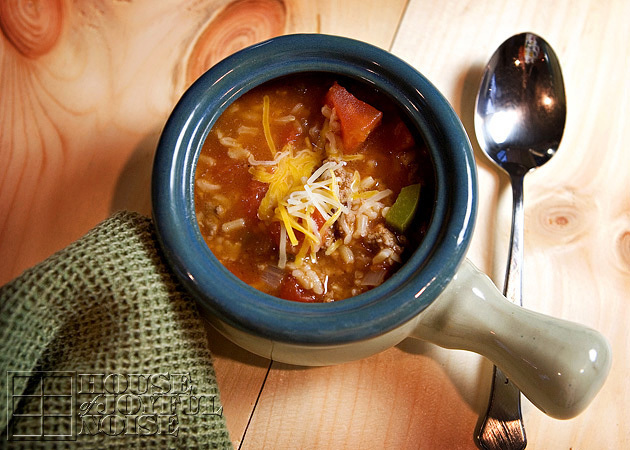 So today I’m going to share with you a new a great recipe: Stuffed Pepper Soup! I don’t know where I even got it. I’ve had it printed out in my recipe folder, and we’ve enjoyed it a couple of time now. We’re about ready to make it again! It’s a recipe you’ll want to have on hand to enjoy from the start of fall, right on through winter! If you even ‘like’ stuffed peppers, you just might ‘love’ . . . . . .
1. 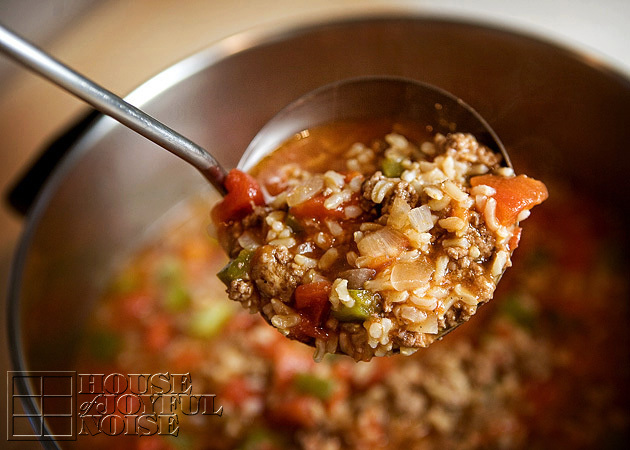 In a large pot, brown and crumble ground beef along with diced green peppers, and onion over medium high heat. 2. When cooked, drain excess grease from beef mixture. 3. Put beef back into pot. 4. Add in diced tomatoes. 5. Add in chicken broth, (or beef broth if using that). 6. Give it all a good stir. Then add in rice. Cover and let simmer on low-medium heat for about 30 minutes to let the flavors get to know each other. 🙂 The longer they sit together, the better the soup is. So consider making it one day, refrigerating, and serving the next day. Or….just have leftovers the next day, and you’ll find it’s even better!